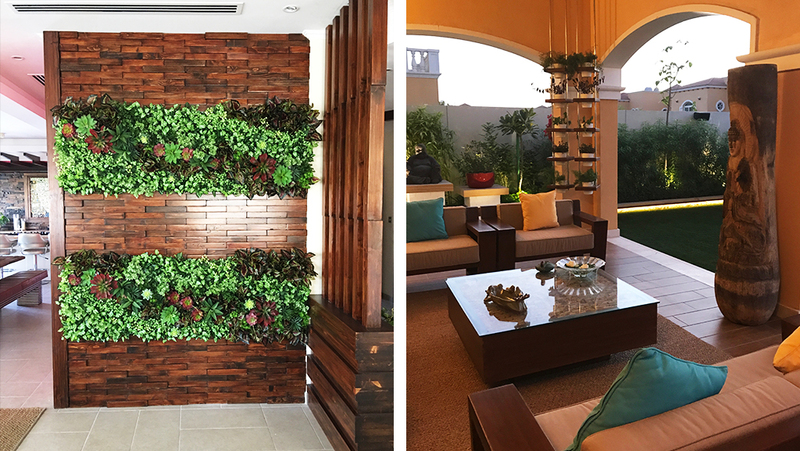 Homeowners are shifting towards smart landscape solutions, which means we’re finding innovative and creative ways to adapt to environmental elements, making continued advances in technology and taking outdoor living to the next level ! 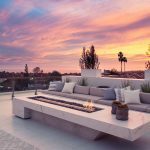 At the same time, 2017 returns to simple plantings, and although innovation in landscaping continues to accelerate, savoring the effortless beauty of the great outdoors remains a top priority. Smart technology, thoughtful, yet simplistic design, and sustainability are the keywords when it comes to landscapes design in 2017. Greenery isn’t just Pantone’s 2017 Color of the Year for interior design. 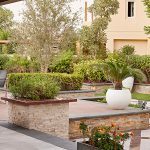 True greenery is the theme of landscape design for 2017. Combining green plant life in a variety of textures and shades, ranging from formal hedges of green velvet boxwood to a border of green lilyturf creates a statement as bold and impactful as a backyard filled with a rainbow of colorful flowers and plants. Hygge is a Danish concept that centers on building an ambiance of coziness, centered on embracing the simple pleasures of life. Hygge is making a powerful impact on landscape design this year. Start by decorating with light, arranging your outdoor seating for intimate conversations, planting fragrant flowers, and adding soothing water features to promote mindfulness. 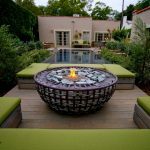 These few simple tricks are easy ways to integrate hygge into landscapes, while simultaneously creating a comfortable and fulfilling outdoor space. Outdoor kitchens are sure to add a sizzle to your backyard space! We’re not talking about your typical charcoal grill. Outdoor kitchens are taking it up a notch by creating state of the art living spaces for cooking, dining and entertain in your backyard. Outdoor kitchens now include smart home technology, such as built-in consoles on refrigerator doors, mobile app-controlled LED lighting, and ovens integrated with Wi-Fi. Now you really can have all of the comforts of home even when you are outside! When it comes to outdoor kitchens, dining al fresco is only part of the fun. The dinner party really starts to sizzle when you serve the entire experience in the great outdoors! Are you looking to create an outdoor kitchen for the amazing outdoor living? Here are a few more Tips for Designing an Outdoor Kitchen that Really Cooks! 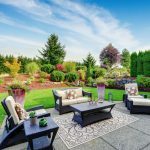 Smart grass can better withstand the elements while still delivering an aesthetically beautiful and healthy lawn, making them especially desirable in drought-prone areas. 2017 is the year of eco-friendly, sustainable, and environmentally conscious landscape design. There is an increased focus on the importance of pollinators and their importance to our ecosystem. This heightened awareness has inspired homeowners to develop gardens that specifically attract vital honeybees, hummingbirds, and butterflies. If you would like to create more pollinators in your backyard start by adding native plantings that are abundant, year-round nectar sources throughout in your yard. Not only do they help promote gorgeous growth but they bring your garden to live with the buzzing and fluttering elements of mother nature. Some landscape design trends come and go. However, with the growing focus on environmentally friendly and sustainable living, our backyard landscape design provides the perfect opportunity to give back to the world while creating an outdoor sanctuary to enjoy with our family and friends for years to come.